Stealing Bundles - thanoscardgamess jimdo page! This game is also commonly known as Steal the Old Man's Bundle or Steal the Old Man's Pack. 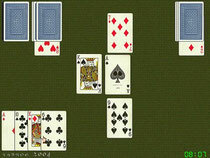 It is a fairly simple fishing game, for 2, 3 or 4 players, using a standard 52-card pack. At your turn you must play one card from your hand face up to the table. If the card you play matches the rank of any of the face up centre cards, you must take the card you played and any matched cards and place them in a face up pile in front of you, to start your 'bundle'. If you play a card that matches the top card of an opponent's bundle, you steal their whole of their bundle and add it to the top of yours, placing the matching card that you played on top. You may play the game with one, two or three computer opponents.